What can this mini computer do? ●Office Work: Office, skype, yahoo, outlook and all other office requirement support and runs perfect. ●Design Work: Photoshop, CoreIDRAW, Dreamweaver, IIIustrator, Flash, Indesign and others. ●Game Playing: Support most online games and PC games, like Warcraft, Counter-Strike (CS), support 3D games but this is integrated graphic not independent cards, so don't play very high grade 3D games. ●Entertainment: Support 4k video play, XBMC and others. ●Warm Note: It doesn't onboard any ROM and RAM, all extra ROM and RAM are required to buy separately. ● Processor chipset: Intel HM96 Express. ● Sealed construction with fanless operation. ● Support Intel core i3 and maximum speed can be up to 2.0GHz. ● Support Giga LAN, 4 USB 3.0 and 2 USB 2.0 ports. ● Onboard 2 DDR3L memory slot support up to 16GB RAM. ● Onboard mSATA and SATA port support SSD + HDD dual storage. ● Low power 12V power supply. ● Support Windows 7, 8, 10 and all kind of Linux OS. ● We have 3 CPU optional: Intel Core-i5-4200U (2.6GHz), Intel Core-i3-5005U (2.0GHz), Intel Core-i3-4010U (1.7GHz). ● Work as normal mini desktop computer, only need connecting to monitor, keyboard and mouse to make a full computing system. 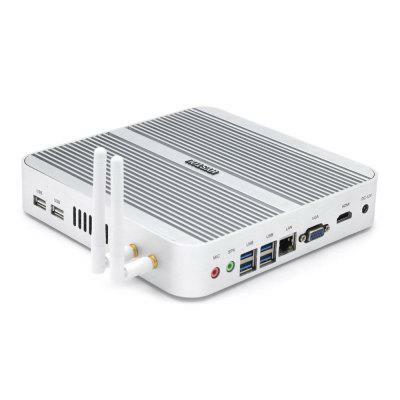 ● Work as HTPC, using HDMI cable connecting to HDTV, support remote air mouse and keyboard controller. Want to be notified when the HYSTOU FMP03 Fanless Mini PC gets even cheaper? Make sure you snag the best price by entering your email below. We'll email you when the price drops, free! We're tracking the price of the HYSTOU FMP03 Fanless Mini PC every day so you know if that deal is really a steal! Check back for to check the best price for this product - and whether its current sale price is really the cheapest it's been! No HYSTOU FMP03 Fanless Mini PC coupons found!